The Supreme Court said it would contemplate summoning the Union Home Secretary for an explanation over not cooperating in the NRC work. 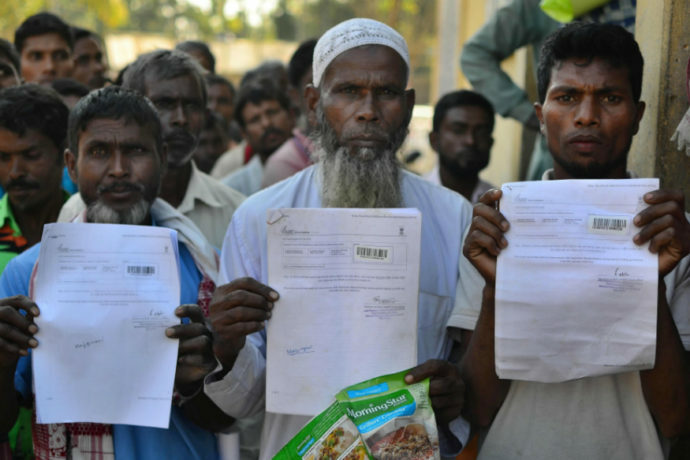 New Delhi, Feb 5: The Supreme Court on Tuesday reproached the Centre to seek suspension of the NRC updation in Assam, observing that the government seems to be “hell bent on destroying the NRC”. A bench comprising Chief Justice of India Ranjan Gogoi and Justice Rohinton F Nariman refused to suspend the process of deciding claims and objections of those who were left out of first draft of the National Register of Citizens (NRC). The court’s censure have come at a time when the BJP, through its top leaders, has been talking about its commitment to implement the NRC in Assam, and has also sought to take some credit of the process in their political speeches. “We are very disappointed with your request. We are sorry to say but the Ministry of Home Affairs (MHA) is delaying the NRC work. We are left anguished. The MHA seems hell bent on destroying the NRC,” remarked the CJI. The observations came after Attorney General KK Venugopal, representing the central government, made a request for suspension of the NRC work in the wake of the upcoming general elections. Venugopal said that it would not be conducive to go on with the simultaneous process of deciding claims and objections for the NRC after the Election Commission notifies the Lok Sabha elections. The top law officer added that 167 companies of the central forces, which are currently deployed for the NRC work, will also have to be moved during the general elections. The Attorney General urged the bench to put the NRC process in abeyance for the period between notification of the polls and two weeks after the votes are cast. But the submission left the bench anguished. “We just say that the government of India is not cooperating. When it wants to do something, it can come up with one thousand ways of doing something. But in this case, you don’t want to cooperate,” it retorted. “Elections are definitely to be held peacefully but the NRC must also have to keep going. Elections and NRC must go together. Both the exercises are important for the country,” the bench added, making it clear that it would not extend the deadline of July 31, 2019 for publication of the final list of the NRC in Assam. In its order, the bench directed the Assam government to keep adequate number of officials free for the NRC work. Election Commission should also examine exemption of officers to carry on the NRC work during the polls, it added. “Least interference should be made in the NRC work,” maintained the bench, reiterating that deadline for final NRC remains July 31. The court will hear the case next in the first week of March.